"Opinion surveys" is a complete field that professionals spend years studying before jumping into the market with their dicks! I'm sure just like you have become an EXPERT in conducting surveys, the people you asked the questions also became EXPERTS in Politics similarly!! sir translate in urdu what you wrote othewise patwari wil think that nawaz sharif is out of jail and elections are next month. There is nothing scientific about this so-called 'survey'. 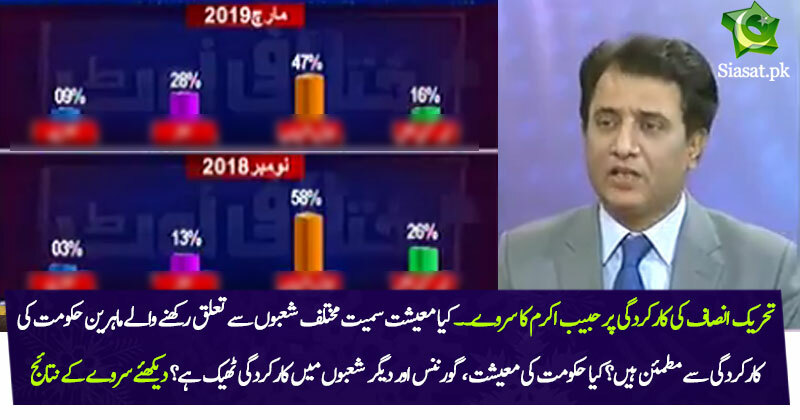 Yeh 46% jo keh rahai hain peechli hukoomat sai behtar nahin hai woh kia gadhai ka gosht khatai hain khotai keh bachai? Everytime Habib Akram conducts a 'survey' 10 statisticians pass away. Nahin mohtaaj tasweeron ka jissay izzat Khuda nay di! Economy ki maa bahen ek kardi aur tu izaath aur shaksait parasti main laga howa hai. Aur apni ugly face par lannat kab baijiu gay. Yaar appas ki baath hai bohat hee ugly lag rahey ho. Adding this “dirtical” to my ignore list.